A Snow Day in May? In mid-May 2013 an unused district snow day provided a three-day weekend one week before the end of the school year. I took the opportunity to flee to Arkansas for a break. After a nice lunch at El Chico in Tulsa, I drove east on 412 to start with a now-familiar hike at Devil’s Den State Park near Winslow, Arkansas. 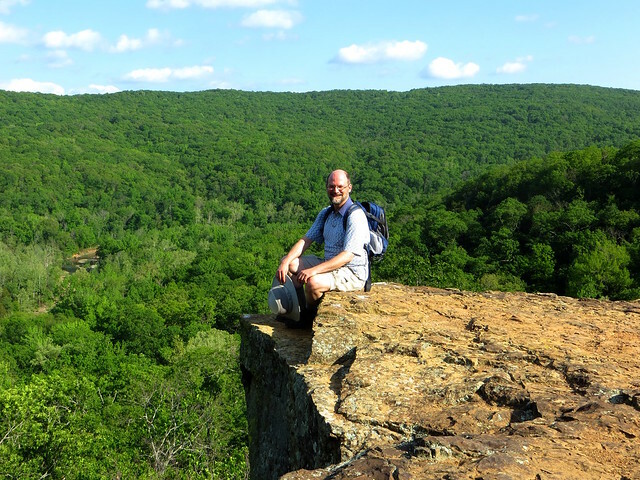 I hiked 4.3 miles along Lake Devil and up the Yellow Rock Trail, where I perched and stood on the edge of the high bluff, admiring the forest below. Back down at Lake Devil, the spillway had a good flow, although I was disappointed to find the paddle boats locked up and unavailable. The park was fairly empty compared to how it is on weekends. When I washed up at the restroom after the hot and humid hike, I glimpsed the spillway through the trees and noticed how the CCC worker statue appeared to be standing on a vehicle’s hood. Get down from there! You’re too heavy! Friday evening I cleaned up at my room at the DoubleTree Club in Springdale and had a late dinner at the adjacent Denny’s. Saturday morning I arose to drive east to War Eagle Mill, where I found a Great Blue Heron posing by the large undershot paddle wheel. Walking out onto the narrow 1908 bridge across War Eagle Creek, I could look east back at the mill or spy animal life in the water along the western shore. Two large snakes were bobbing in the rushing water and along the western shore, below the natural dam, huge trout were lined up, feeding. I recrossed to the mill side and toured the three floors of the structure, but resisted making any purchases. Then I drove northwest to downtown Bentonville for the fantastic four-cheese ravioli at Tavola Trattoria. Next was what has become a regular art stop for me, visiting the “Redneck Guggenheim”: Crystal Bridges Museum of American Art. Several of the pieces in the main collection had been swapped out, which was welcome since the temporary Norman Rockwell exhibit had very long lines and was something I decided to put off for a later visit. The museum was packed with people, so despite the heat and humidity I was glad to escape to the Tulip Trail, where a docent told me that the large bench I’d previously admired wasn’t built into a new berm but into the remains of an old railroad bed. The backers of the rail bed went bust before any rails were installed, but portions of it remain. I made the rather warm and tiring decision to circumnavigate the museum’s north lawn on the Art Trail and Rock Ledge Trail, snapping a framed self-portrait along the latter. A delicious cupcake at the museum cafe did not stop me from having a hearty fried chicken dinner at the old AQ Chicken House in Springdale. 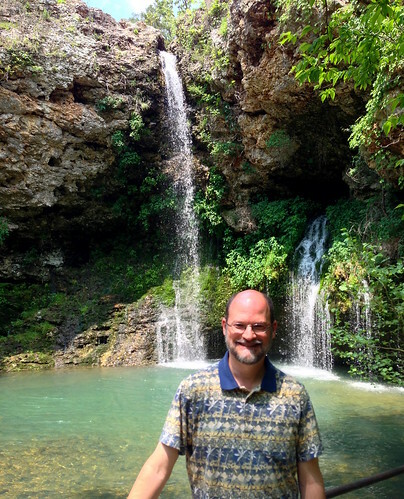 Sunday morning I arose late to dine at the nearby MarketPlace Grill and drove west to stop and enjoy the waterfalls at Natural Falls State Park in Oklahoma, which was formerly called Dripping Springs. The falls were running strong and I soaked in the cool mist and calming sounds. It was a nice way to end this brief escape before I faced a week chock full of meetings and final exams, culminating in my 24th Commencement as a teacher at Bartlesville High School.